It is the time of year when little sprinkles from San Diego Comic Con begin to appear. My schedule is starting to take shape and I hope it has room for another taping of Conan and maybe some Conan Bingo in addition to the fun that takes place in the convention center. Each year I make the trek to SDCC I try to find some cool exclusives for my kids and this year I hope my daughter adds to her DC Super Hero Girls collection and asks for Katana. Just a truly beautiful collectible that will be ripped out of the box and thrown into a bin of toys to be played with. Onward to the comics! Birthright #16 - There has been a bit of a break since we last visited Birthright, but man was the wait worth it. To catch people up, Mikey vanished when he was a child and everyone assumed his dad killed him. He returned, much aged, a couple of years later claiming to have been abducted and living in Terrenos as the chosen one. It is thought that he defeated Lore, but the spirit of Lore (the Nevermind) infected Mikey and he returned to Earth to bring destruction. In addition to this, there are a series of mages who have been traveling to and from Terrenos and have a vested interested in Mikey and the Nevermind. With that in mind, understanding there are a lot of details that Joshua Williamson packed into this series that I don't have time to get into, we are gearing towards an epic battle between the mages. In addition to that, it turns out that Mikey's grandfather is a mage from Terrenos, and didn't even stand up for Mikey's dad when he was missing. There is another twist that I oh so want to mention, but don't want to spoil anything. Mikey, his brother, his father, and his grandfather have a lot to figure out if they are going to come together and stand a chance against the other mages. I thought this series had slowed down and I was quite wrong. Darth Vader #21 - I would have never guessed that a wise-cracking, murdering droid similar to C-3PO would steal the show in this comic. 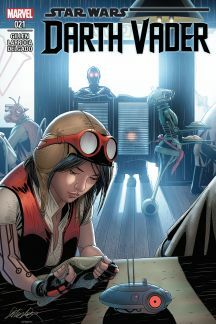 While Vader is tracking down a traitor and on a Cylon Raider type "living" ship, Triple-0 is tasked with tracking down Dr. Aphra. Triple-0 delivers lines like "Answering DID keep him alive, Beetee! Just not for very long." and "I'm sure you'll find not telling anyone anything a far less demanding task when you're safely disposed of, master." while commanding a droid army and slaughtering a large number of friendly locals. In an odd turn of events I find myself much more interested in the droids then of Vader himself. Dear Mavel. Please give us a spin-off of these ultra-violent droids. I want to learn more about them. Wonder Woman: Rebirth #1 - I will say that this is the first title that made me truly appreciate the whole "Rebirth" event. While it is an attempt to reverse course from the New 52, it is also an opportunity for readers to catch up with a character's past. The New 52 wiped that clean, but "Rebirth" brings everything back. As someone who is not an avid Wonder Woman reader, this was a bit overwhelming and I was lost a couple of times, but I feel that I can stick with this series and learn to appreciate Princess Diana. While I am not sold on "Rebirth" and feel it is a bit of a gimmick to sell books, it accomplished its goal as I picked this up and will likely check out the series for at least the first arc. 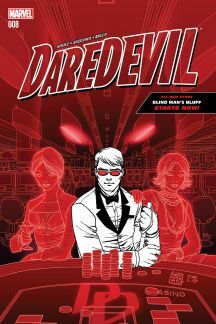 Daredevil #8 - We have a new arc and the first issue is a fun Texas Hold 'em tournament in which Daredevil uses his ability to read people as he hopes to win it all. The only problem is the person the casino wants to win is a telepath named Mr. Apex who has a clear advantage over everyone. That is except for a player who is unaware of what the house has dealt him. Fun intro in what is setting up to be a team-up with Spider-Man as the two pursue something overseas in Macau.